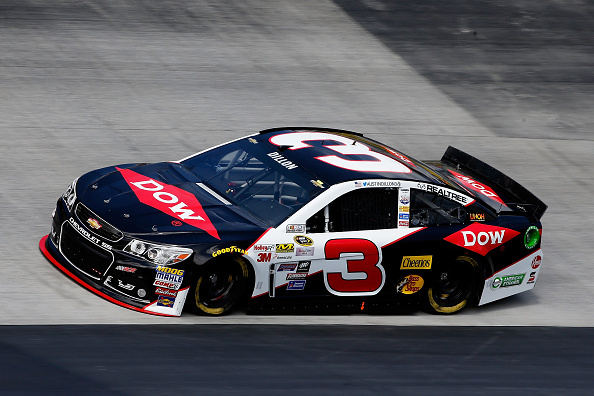 Austin Dillon took the number 3 back to victory lane at Charlotte early Monday morning. 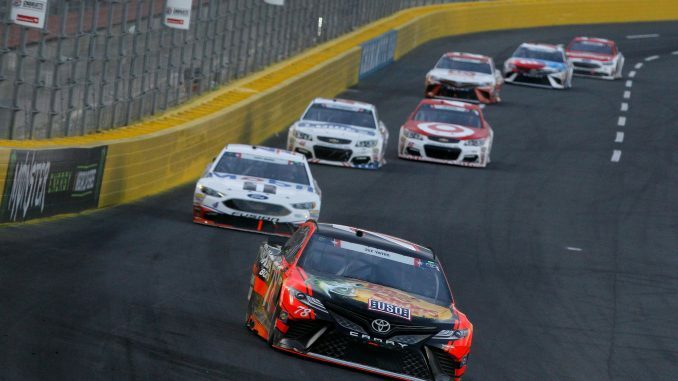 Here’s how it all went down in the Monster Energy NASCAR Cup Series Coca-Cola 600 at Charlotte Motor Speedway. From his second consecutive Charlotte pole, Kevin Harvick led the field to the green; Kyle Busch started second followed by Chase Elliott, Matt Kenseth and Erik Jones. Harvick and Busch were side by side for the entire lap, with both crossing the line in a dead heat at the end of lap 1. Busch had pulled out to the lead by lap 2. Jones moved to second has Harvick took third; Harvick took the spot back on lap 4. Ryan Blaney was fourth, Elliott fifth. The lead had stabilized to just over a second by lap 14, as Busch had caught the back of the field. Busch’s lead was 2.4 seconds by lap 18. At the start of lap 19, Jeffery Earnhardt appeared to lose an engine exiting turn 3. In front of him on the front stretch, Elliott suddenly had flames burst out from his hood and he slowed; Brad Keselowski couldn’t slow in time and plowed into Elliott. Both cars were done for the night. Replays showed that something appeared to come out from under the back of the Earnhardt car and possible hit the engine of Elliott’s car. NASCAR said that the race’s first caution would count as a competition caution that had been scheduled for lap 25. The leaders pitted. Kyle Busch was out first, followed by Harvick, Kenseth, Blaney and Truex. Jones had a long pit stop with damage from the incident. Green came out on lap 27: Harvick took the lead as Busch fell into second, but close behind; Kenseth was third, Blaney fourth, Truex fifth. A thunderstorm was looming nearby by lap 48. Blaney had started to fade and the top five were, Harvick, Kyle Busch, Kenseth, Truex and Jimmie Johnson. Blaney had fallen to seventh. The lead for Harvick was just under a half a second. In heavy lapped traffic, Busch was staying close Harvick. Kenseth soon joined the two. Busch was looking for the lead on lap 64; Kenseth and Harvick pitted along with several others behind. Busch pitted on lap 67. Denny Hamlin was penalized for speeding during the stops. When the stops cycled through on lap 76, Truex led followed by Harvick, Busch, Kenseth and Johnson. Busch took second place on lap 77. Busch was soon pulling away from Harvick and looking for the lead. Buy lap 87, Busch was less than a half a second behind Truex. Johnson took fourth from Kenseth on the same lap. Busch took the lead exiting turn 4 on lap 89. Kyle Larson who missed qualifying Thursday and forced to start 37th was sixth by lap 98. Stage 1 top 10, lap 100: Kyle Busch, Truex, Harvick, Johnson, Kenseth, Larson, Blaney, Clint Bowyer, Kurt Busch and Jamie McMurray. Leaders pitted on lap 102. Harvick was out first, Truex second followed by Kenseth, Johnson and Kyle Busch. Green came out to start lap 107. Like being shot out of a cannon, Truex took the lead. Harvick settled into second, Johnson third. Larson was looking for third from Johnson a lap later as Kenseth hovered in fifth. Johnson held off Larson and the top five were soon single file. Kyle Busch had fallen to sixth. Johnson was looking for second by lap 117. Larson seized the opportunity though and took third from Johnson. Larson took second on lap 122 and Johnson came with him. Harvick pitted under green on lap 124 with a possible tire going down; he lost a lap and came out 23rd, as ahead Johnson took second. Harvick’s crew reported the tire was not going down, the wheel itself was loose. The top 5 lap 128: Truex, Johnson, Larson, Kenseth, Kyle Busch. Truex had a lead of 3.6 seconds. Matt Dibenedetto got into the wall on lap 142 and the third caution of the day came out. There was lightening in the area and in the interest of fan safety, NASCAR pout out the red flag. The red flag lasted for 1:39:56. When the yellow came out just after 9:30 p.m. the cars turned yellow flag laps, to help dry the track. After several laps under caution to dry pit road, it was open and the leaders pitted in lap 150. Truex was out first followed by Johnson, Kenseth, Blaney and Larson. Harvick got the free pass and restarted 21st. however he repitted with an issue with the right rear tire and the crew wanted to check for lugnuts tight; Joey Logano also did the same prior to the green. Logano was 16th. The green finally came back out to start lap 153. 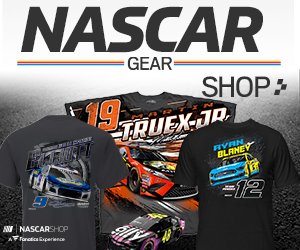 Truex jumped out to the lead. Johnson had second by the end of the lap, Kenseth was third followed by Blaney and Kyle Busch. Larson was looking for fifth from Busch. Busch was able to defend and soon had the spot to himself. Johnson was reeling in Truex by lap 161. He was looking for the lead by lap 164. Johnson kept putting pressure on Truex as behind, Kenseth was slowly creeping up. Busch got past Blaney for fourth and looking for third from Kenseth. Busch took third on lap 173. Danica Patrick hit the wall on lap 174 after cutting down a right side tire and caution four came out. She was able to make it back to the pits. The leaders pitted. Truex was out first followed by Kyle Busch, Johnson, Kurt Busch and Kenseth. Blaney stalled on pit road, and then rolled slowly with a possible broken axle. Green came back out to start lap 179; Paul Menard who stayed out led the field to the green. There were 21 laps to the end of the stage. Truex to the lead on the outside; Johnson followed. Menard was fourth by the end of the lap and dropping. By lap 181 the top five were Truex, Johnson, Kenseth, Kyle then Kurt Busch. Blaney came out of the garage on lap 182, five laps down. Menard was 17th. Kyle Busch was catching Kenseth for third by lap 187. Kurt Busch was close behind. The lead for Truex was just over a second. The second stage ended on lap 200 on lap 199 Johnson tired to make a move but fell short. Caution five came out. The top 10 in Stage 2: Truex, Johnson, Kenseth, Kyle Busch, Kurt Busch, Jamie McMurray, Austin Dillon, Erik Jones, Larson and Hamlin. The leaders pitted on lap 203. Truex was out first, Johnson second with Kenseth, Kyle Busch, McMurray, and Larson rounding out the top five. Green came out to start lap 205. Truex leapt to the lead, Johnson was pushed by Kyle Busch on the outside and nearly spun; he recovered and soon had fourth over Kyle Busch. Kenseth was second, McMurray third. Harvick had worked hi way back to 10th by lap 211, but was reporting a possible loose wheel again. The lead for Truex was 1.2 seconds. Kyle Busch was looking for fourth from Johnson by lap 214. Johnson took third from McMurray on lap 219. Kyle Busch followed to take fourth and relegating McMurray to fifth. Kyle Busch took third on lap 222. The lead for Truex was 3.5 seconds by lap 243. Ty Dillon blew an engine on lap 245 exiting turn 3; Harvick in 10th, spun in the oil behind and caution six flew. Kasey Kahne also got into the oil. Harvick had no damage and continued; Kahne hit the wall hard between turns 3 and 4 and was forced to the garage. Larson also hit the wall exiting turn 4 and pitted while the pits were closed for repairs. The leaders pitted except Johnson who was on pit road just prior to the yellow. Truex was out first followed by Kenseth, Kyle Busch, McMurray and Hamlin. Green came out to start lap 252. Truex on the outside rocketed to the lead as Johnson dealt with Kyle Busch for second, Kenseth and McMurray rounded out the top five. Johnson held off Busch and by lap 259 was trying to catch Truex. Busch rebounded though and was looking for second on lap 267. Truex had stretched his lead out to 1.5 seconds. Hamlin took fifth on lap 268. The lead for Truex was 2.3 seconds by lap 279. Harvick had rallied back to 10th, again. Kyle Busch was looking for second from Johnson by lap 281. In lapped traffic he was able to get the spot on lap 284. Larson got into the wall in turn 2 on lap 292 and caution seven came out. With heavy damage, Larson, the points leader coming into the race, limped to the pits then to the garage for his worst finish of the season. The leaders followed. Hamlin was out first, Kyle Busch second, followed Truex, Kenseth and Austin Dillon. Green came out to start lap 297; three laps to the stage end. Ricky Stenhouse Jr. stayed out and had the lead. Stenhouse was pushed out of the way as Hamlin shot to the lead underneath; Johnson was also shuffled back to 12th. Kyle Busch was second, Kenseth third, followed by Truex and Jones. The top 10 at the end of Stage 3: Hamlin, Kyle Busch, Kenseth, Truex, Jones, Kurt Busch, Harvick, Daniel Suarez, Dale Earnhardt Jr. and Austin Dillon just edging out Johnson. Johnson pitted from 11th, several behind followed but the leaders stayed out. Green came out to start lap 306. Kyle Busch took the lead, Truex pushed his way past Hamlin to take second. Kenseth took third, Kurt Busch was fourth, Jones fifth; Harvick had fought his way to sixth. Hamlin landed in seventh. Truex stayed close to Busch; he caught him on lap 315 and was looking for the lead. Kurt Busch took fourth on lap 318 as the lead for his younger brother had stabilized. Jones retook the spot on lap 321. Hamlin and Harvick were fighting for sixth by lap 323; Hamlin took the spot on lap 324. McMurray pitted on lap 327 with a flat tire. Patrick hit the wall again, with another flat tire on lap 328 and caution eight came out. The leaders pitted. Kyle Busch was out first, Truex followed. Kenseth, Kurt Busch and Erik Jones rounded out the top five. Green came out to start lap 333. Truex took the lead on the inside, Kyle Busch fell into second; Kurt Busch was third and looking for second, Kenseth was fourth, Harvick fifth. The lead for Truex was 1.2 seconds by lap 337. There were 22 cars on the lead lap. Kenseth took third on lap 348. Johnson had moved to sixth by lap 354. Hamlin pitted under green n lap 366. Truex, Kyle Busch, and Kenseth followed as did Jones. Kurt Busch and Harvick pitted on lap 369. Johnson led a group of seven drivers total who stayed out. He lead followed by Austin Dillon, Logano, Ryan Newman, Chris Buescher, Menard, and Trevor Bayne. Truex with fresher tires was making up a second a lap. He was fourth by lap 381. Kyle Busch took fifth on lap 384. he took third on lap 387. Kyle Busch took fourth on lap 389. With 7 to go, Truex was in third, 4 seconds back of the leaders. With four laps to go the lead was 3.5 seconds for Johnson over Truex, Dillon held second just behind. Johnson however ran out of fuel two laps from the end; Dillon took the point. In the final tense lap, Dillon had enough fuel and won his first career Cup race by .835 seconds. Kyle Busch passed Truex in the closing laps to take second, with Kenseth fourth behind Truex, and Hamlin fifth. Kurt Busch was sixth, Jones seventh, Harvick eighth, with Newman and Earnhardt Jr. rounding out the top 10. The series heads to Dover for the AAA 400 Drive for Autism next Sunday at 1:00 p.m. ET.